LOS ANGELES (AP) — Notre Dame has reached the grand finale of its regular season without a defeat, surviving a perilous path from San Diego to the Bronx and back with its championship dreams intact. The remaining road before the No. 3 Fighting Irish is suddenly quite clear. With a win over struggling Southern California on Saturday night at the Coliseum, Notre Dame (11-0, No. 3 CFP) should secure a spot in the College Football Playoff. The final challenge doesn’t look terribly daunting on paper. While Notre Dame is on the brink of a playoff berth, USC simply is on the brink. The Irish are big favorites against the Trojans (5-6), who are wrapping up their worst regular season since 2000. They’ve lost four of their last five games amid injury problems and a clear decline in performance during the second half of the year. But players and coaches on both sidelines are well aware that this famed rivalry doesn’t always conform to what’s expected. They know there’s much more on the line than a playoff berth, or even the gloriously gaudy Jeweled Shillelagh, every year when these glamorous programs add a 90th chapter to their intersectional history. The Trojans have plenty of motivation regardless of their opponent. They’re playing for bowl eligibility — and they could be playing for Clay Helton’s job, depending on how seriously athletic director Lynn Swann is taking the complaints of the unsatisfied segment of USC’s fan base. The Irish don’t see these unusual rivalry circumstances as anything they can’t handle — not with their ultimate goals in clear view. DOMINANT DEFENSE: USC’s offense has struggled down the stretch, and Notre Dame’s defense likely is its most formidable foe yet. The Irish are allowing just 321 yards per game, putting them in the top 20 in the nation. One week after nearly shutting out a Syracuse team averaging 44.4 points per game, Notre Dame’s defense will attempt to clamp down on Daniels and a USC offense ranked 11th in the Pac-12 with just 377.1 yards per game. DANGEROUS DEXTER: The USC defense must try to slow Notre Dame running back Dexter Williams, who has 844 yards in just seven games. That could be a problem for the Trojans, who just gave up 289 yards rushing last week to UCLA’s Joshua Kelley. USC has yielded 200 yards rushing three times during its current 1-4 skid. SHIFTING TIDES: The Trojans have won 11 of the last 16 meetings in this rivalry, including eight straight under Pete Carroll. But the Irish have won five of the last eight since Carroll left USC, including last year’s 49-14 laugher in South Bend. Notre Dame was in a similar situation in the 2012 rivalry game, heading into the Coliseum needing a victory to complete an undefeated season against a struggling USC squad under Lane Kiffin. 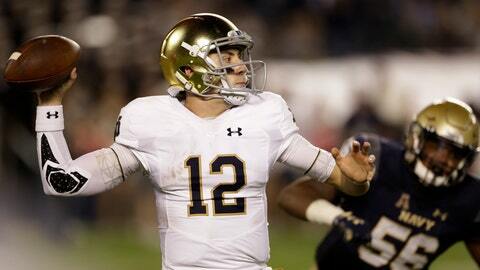 The Irish pulled out a difficult 22-13 victory to earn a spot in the BCS championship game. NOVEMBER BLUES: Notre Dame has a recent history of late-season slipups under coach Brian Kelly, dampening otherwise successful seasons. The Irish lost twice in November last year after an 8-1 start, and they lost their regular season finale to Stanford in 2015 after a 10-1 start. They also lost twice in November 2013 after a 7-2 start. “Win the month of November” was among Notre Dame’s preseason goals, according to Kelly, and these Irish have been different: They’ve avoided all slip-ups down the stretch, holding off Pitt and Northwestern in narrow victories among a string of blowouts. MISSING OUT: This game could be the finale of Helton’s tenure just one year after the Trojans won the Pac-12. NCAA sanctions were the only reason USC has missed a bowl game since 2000, the final year of coach Paul Hackett’s tenure before Carroll took over. A 5-7 finish might force the hand of Swann, who handed a contract extension through 2023 to Helton earlier this year. But Helton betrays no public sign of worry about his future at the program he inherited in 2015, saying he has received unwavering support from Swann.